Co-release with Dying Sun Records and Third-I-Rex. Swedish doom band Pissboiler relased　"In The Lair Of Lucid Nightmares" from Third-I-Rex in December 2017, and they never stop to obliterate the world with extremely slow and heavy doomed sonic torture! 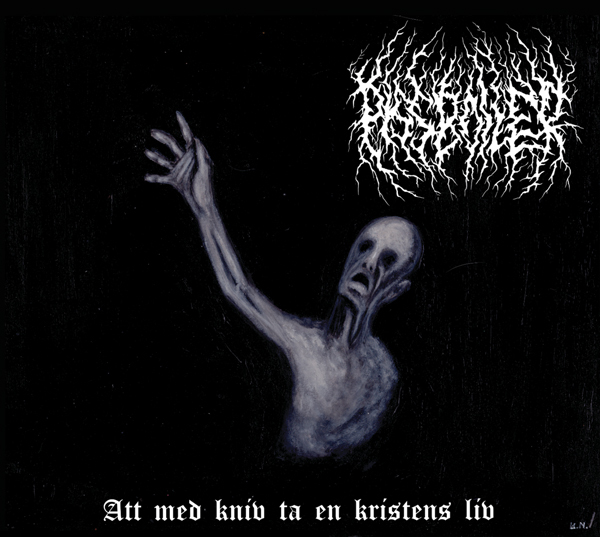 They unleash new EP "Att Med Kniv Ta En Kristens Liv" in league with 3 doomed labels Third-I-Rex, Dying Sun Records and Weird Truth Productions. If I describe Pissboiler's music in a few words, it's "hybrid of funeral doom and extreme sludge/drone". Low frequency crawling oppression combined with emotional funeral dirge. The concept of this album is murder case that 2 old men were stabbed to kill in bed. It's joyless and only bitter negativeness here! December 25th 2017, Pissboiler released their debut EP "In The Lair Of Lucid Nightmares" via Third I Rex. The Swedish band gave to the public one of the most incredible debut albums to date, receiving positive responses worldwide from both fans and press. July 2018, the dead is about to resurrect! In league with Weird Truth Productions, Dying Sun Records, and Third I Rex, Pissboiler are ready to obliterate the public with yet another trance inducing album. On July 22nd the band will release worldwide a new EP titled "Att Med Kniv Ta En Kristens Liv". Translating to "To Take The Life Of A Christian With A Knife" this is another collection of painful and tortured songs. Three new tracks plus the previously unreleased "Monolith Of Depression" song, another 26 minute of suffering in music which is going to be available in both digital and physical formats. ".. its the act of murder. The samples used are from a knife murder last year. Two old people got stabbed to death in their beds.. The woman woke up and called 911. That is the sample and the main theme of the EP. Track 1 is the moment before - preparing in front of a fire.. Track 2, the title track is the act of murdering a Christian person in their bed with a knife. Track3 is the aftermath, burning the corpses..". Nothing joyful to think about but negativity and death. This is reality. Get ready for another milestone in modern extreme doom. Where drone and sludge collide, Pissboiler play a funeral dirge for the living.